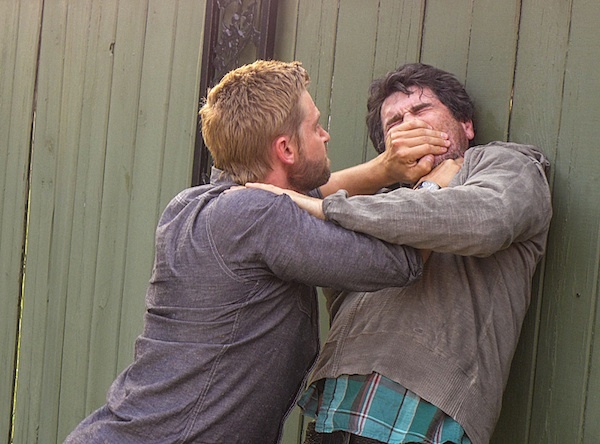 Spoilers if you're not caught up on Under the Dome through "Blue on Blue"! There was cause to celebrate inside the dome when the Mother of All Bombs failed to penetrate the dome and obliterate the population of Chester's Mill. But something tells me that celebration will be short-lived. After all, if a missile can't break through the dome, what can? Nothing comes in, nothing comes out. That includes supplies. And as we see in the preview for this Monday's episode, titled "The Endless Thirst," tension is once again escalating, as things tend to do when people panic en masse. “The Endless Thirst” – When the town begins to run low on water, the residents of Chester’s Mill begin to fight for the remaining resources. 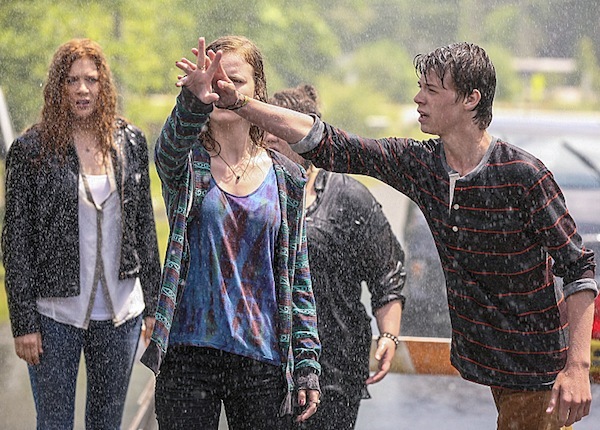 Meanwhile, Julia discovers a strange connection that two of the town’s residents have with the Dome, on UNDER THE DOME, Monday, July 29 (10:00-11:00 PM, ET/PT) on the CBS Television Network. If they're looking for water, they might want to check the floor in the Rennie bunker. Alas, most of that's probably all gone. So what's going on in the preview besides rain inside the dome? Chaos at the supermarket. It appears to be looting season in Chester's Mill. Is that related to the water shortage? Or is it simply that people are starting to realize that they're not getting out of the dome anytime soon and if that's the case, they might want to start stocking their own bunkers. The promo shows a moment between Barbie and Julia. Now that Julia knows Peter was leaving her, maybe she'll have an easier time falling for Barbie… until she finds out about his involvement in her husband's death. That seems inevitable. No idea who the guy is that he has pinned against the wall, but the girl in his arms is Angie, who's once again, in duress. But at least she's not locked up in a bunker or being held at gunpoint by Junior, right? And then there's this photo, which shows Joe and Norrie touching hands. What are they doing? Are they the ones who make it rain? We do know the dome has interacted with them before. Maybe Norrie and Joe get the dome to give them water. Just a theory. 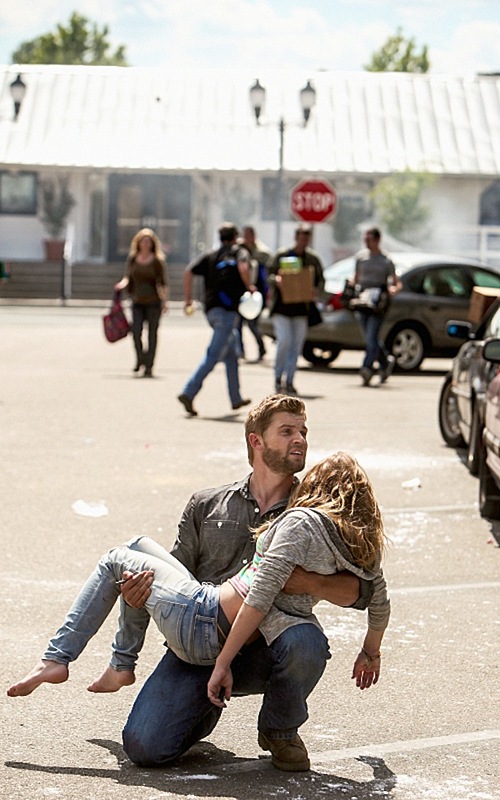 In case you haven't checked it out, read our breakdown of the Under the Dome Comic-Con panel here.